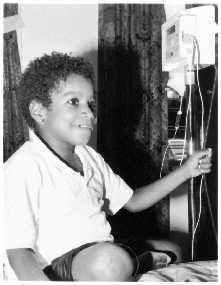 Travis Jefferies is a ten-year-old African-American boy with a warm personality, an infectious smile and full-blown AIDS. When we first meet him, Travis is six and has been unable to eat for months due to intractable sores on his mouth, esophagus and stomach. Filmed over the next three years, TRAVIS chronicles his daily life together with his grandmother, Mrs. Geneva Jefferies. They live in Highbridge, a predominantly African American and Latino neighborhood in the South Bronx, in which one of every twenty teenagers is HIV positive. Travis contracted the HIV virus from his mother Samantha, a crack-cocaine user who is largely absent from his life. The tireless efforts of his grandmother, though, come through forcefully. Mrs. Jefferies, who has worked as a domestic since the ninth grade, has found ways to keep her large family of 11 children and 33 grandchildren together while caring for Travis, ministering to his constant medical needs, and answering his many questions about the very grown-up illness he faces. The film follows the development of Travis's disease and treatments (during his short life, Travis has taken over 275 different drugs). The anti-retroviral drugs he had been taking, including AZT, begin to lose their effectiveness. His primary care physician Dr. Heidi Beutler at the Columbia Presbyterian Medical Center decides to treat him with protease inhibitors, powerful anti-viral drugs that have been shown to be successful in adults but have never been tried on children. After a downturn that lasts for weeks, Travis responds well. TRAVIS captures not only the major medical events of Travis's life but also the small moments which make his disease both incredibly trying and somehow bearable. Travis meets up with friends at the playground, even if it means pulling an electric feeding pump along, and he goes to a special summer camp for children with AIDS. But, we also watch Travis breakdown when he is not allowed to play in the newly-fallen snow, because the health risks are too great. TRAVIS documents the complex life of a vital child born with HIV/AIDS who, with the help of experimental drug therapy and his grandmother's unwavering love and support struggles to survive and pursue a dignified, happy life. This intimate portrait of a very special child proved to be the last film by award-winning documentary filmmaker Richard Kotuk. TRAVIS is a presentation of The Independent Television Service (ITVS). ITVS was created by Congress to "increase the diversity of programs available to public television, and to serve under-served audiences, in particular minorities and children." TRAVIS will be shown in December, 1998 on local PBS stations. December 1 is World AIDS Day.